Awarded the 2016 Community Event of the Year!! We wanted to increase waste awareness and give people the opportunity to show their creativity. 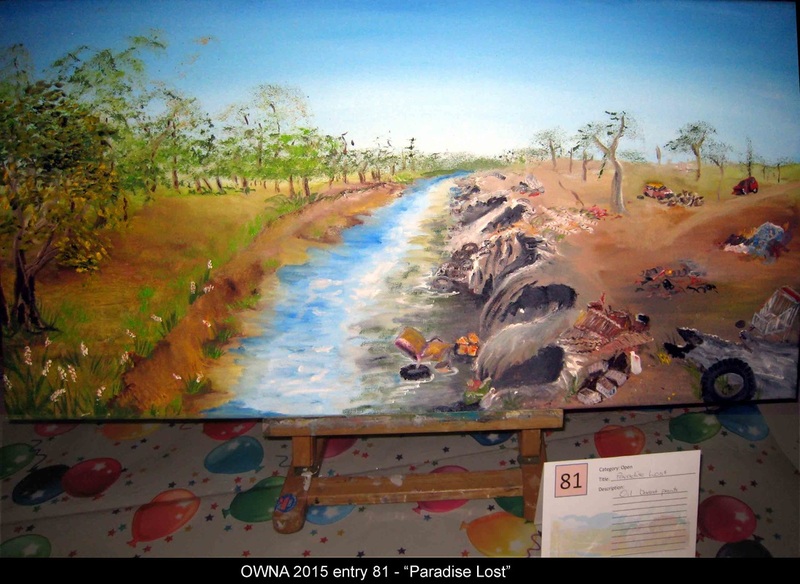 So we created the 'Old Waste, New Art' competition. We invited school students and community members to create an artwork from waste materials. Entries were allowed to be three dimensional (sculptures, functional items such as furniture, wearable items, etc.) and had to be created predominantly from waste, or could be two dimensional (photographs, illustration, painting etc.) - reflecting waste in society. After promoting the competition in the media, local schools, and community networks, we received a wide variety of creative items and artworks - all made from stuff that would otherwise have been thrown away! 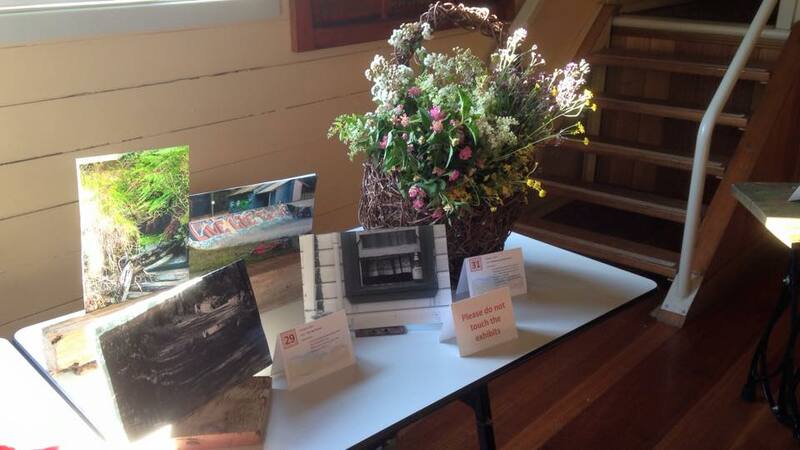 Our exhibition was held in October, alongside the Holmesville Hotel's Billy Cart Derby, at the Holmesville Community Hall. We donated money raised from People's Choice votes to Mum's Cottage. You can check out some photos of the wonderful entries and exhibition on our facebook page. We're looking forward to holding the competition again next year. 'That Dress is Total Rubbish! ", by Cathy Stuart - WINNER, Open category. Made from plastic shopping bags, bread ties, discarded venetian blind slats, bread roll plastic bags & green bubble wrap. 'Recycled coffee break' by Jenene Acland. The nails and timber from three pallets have been recycled to create this coffee table. It is branded with the historic family name of “Chevalley Ford”. Waste education was an important part of the event. 'Free Mickey' by Jayne Parkins. Made from excess yarn from a deceased estate. 'Doors to the Future', by Jasmine Stuart and Isabelle Cox. WINNERS - High school category. Their artwork is made on two old doors, using newspaper, scrap material, toilet roll tubes, egg cartons, tuna cans, cardboard boxes and various other bits of waste. 'Cyborg' by Lucas Allan - WINNER, Primary school category. Made from old computers, an old mannequin front, cardboard, nuts, bolts, screws and an old bike helmet. Competition entrants created a wide range of interesting and beautiful items using recycled 'rubbish'. Images depicting discarded objects alongside a display basket made from Jasmine vine trimmings that would otherwise have ended up in the green waste bin. 'Brain, deconstructed' by Paul Lindsay. Made from foundry waste and scrap rods. 'Table from scrap' by Mick Parkins. 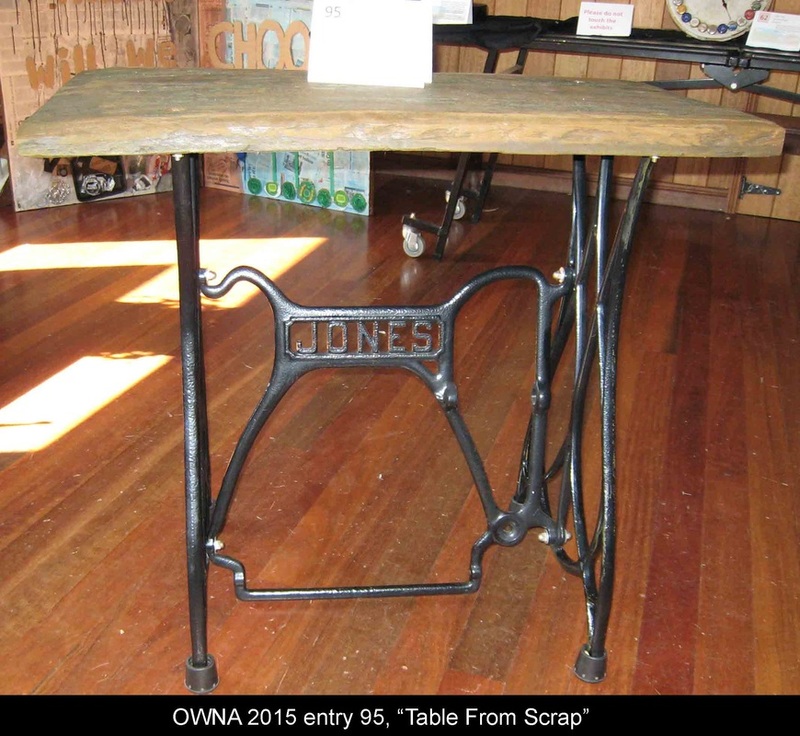 The base is made from old sewing machine legs. The top is made from scrap timber. 'Discarded Treasure' by Maureen Dempsey. Necklace and earrings knitted and crocheted from electrical wire, featuring beads found in a carpark, sea glass from Caves Beach and earring hooks found in a box during bulk waste collection. 'Beer O-Clock' by Maureen Dempsey. Reuse of a paint lid & various beer bottle tops to create a quirky clock. The clock hands were reused from a broken clock. 'Nightscape' by Lucas Allan. 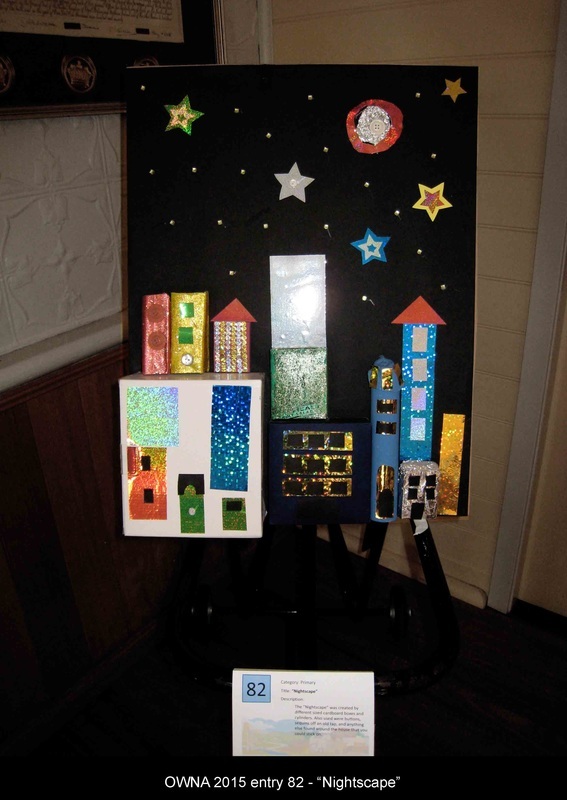 The “Nightscape” was created by different sized cardboard boxes and cylinders. Also used were buttons, sequins off an old top, and anything else found around the house that you could stick on. 'Paradise Lost' by Christine Burton. Oil based paints. For more information, contact the West Wallsend District Sustainable Neighbourhood Group via westwallsenddistrictsng@gmail.com.